Braden gazed at the objects floating around his head. 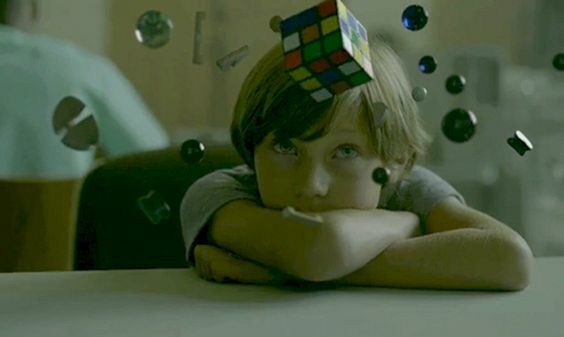 A Rubix Cube, a pencil sharpener, glassy marbles — all that and more bobbed around him. He sat at the white desk in his room, with his folded arms on the smooth surface. The knickknacks around him were being controlled by his mind alone. At only ten years old, Braden was smarter than an average adult. He’d read about a thousand books on varying subjects, one of those being a particularly fascinating one simply called Matilda, which he had finished that day. In the novel, written by Roald Dahl, a young but brilliant girl named Matilda discovers that she can make objects move with her mind. The idea had captured Braden’s mind. Control things with his mind? Like the fictional Matilda, he was too bright for his own good. In the book, all the built-up energy in the girl’s brain could be shoved out through her eyeballs and used to push things or make them hover. After reading the book, Braden decided to see if he also possessed this spectacular power. The minute he arrived home from school, he had locked himself in his room. He’d found a dusty marble under his bed and set it on the desk. Staring at the tiny orb, he gathered all his mental strength and pushed it at the milky marble. “I’m not giving up on you,” Braden whispered, preparing himself to try again. Like before, he glared at the marble and focused all his thoughts on pulling that minuscule marble off the edge of the desk. No result. He sighed heavily, but didn’t give up. He would try a third time. This time, the young genius got tunnel vision. The marble was the only thing he could see, the rest of the world around him blurring together. Pull! his mind screamed. Pull! In a rush, the marble zipped off the desk and hit him between the eyes. Braden leaned back, rubbing his head. He plucked the marble off the dark blue carpet and grinned at it. It had worked! He really could control objects with only his mind! Punching the air, he danced around the room victoriously. His excitement growing, Braden riffled through the junk beneath his bed and produced a Rubix Cube. He hadn’t used it since he’d figured out its trick when he was seven. Now, he would use it as another test subject. He placed it on the desk and stared at it, unblinking. Since it was much larger than the marble, he figured it would take more mental energy to move it, and that it would likely take longer to harness that power. True to his theory, it took him nearly thirty seconds to lift it into the air. But it was gratifying nonetheless. Soon, there were a dozen assorted trinkets floating around his head. A small plastic eagle weaved its way between marbles. Braden stared at them, lost in thought, and amazed that he could do something so wonderful. Shrugging, the boy turned back to his desk. It was probably nothing. His heavy boot collided with Braden’s bedroom door. It splintered and crashed to the carpet with a thud. The black-clad men burst into the room. Braden’s head snapped around to look at the intruders. All he saw was the barrel of a gun, and he only managed a scream before a dart sprouted from his neck. He slumped over. Unconscious, but alive. One of the men scooped the boy’s limp body up and tossed him over his shoulder. They marched over the wreckage of the door and silently left the empty home.